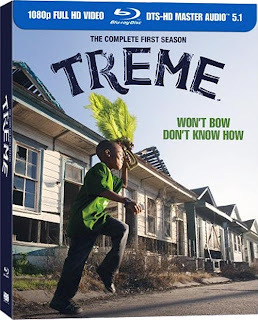 HBO/Warner Home Entertainment will be releasing season one of TREME, on DVD and Blu-ray on March 29th, 2011. Amid the ruins of an American city, ordinary people–musicians, chefs, residents–find themselves clinging to a unique culture and wondering if the city that gave birth to that culture still has a future. From the creators of The Wire comes a new series about adversity and the human spirit, set in New Orleans, in the aftermath of the greatest man-made disaster in American history. Welcome to Treme. I enjoyed season one quite a bit. I hear some complaints of it being preachy, and I don’t disagree, but I found the characters interesting enough to overlook the weaker points. Extras will include Commentary tracks, a Making-Of Documentary and more. MSRP: $79.98 for Blu-ray, $59.99 for DVD.